I will be changing classroom this fall and sadly, my new room was not ready when we exited for the summer. 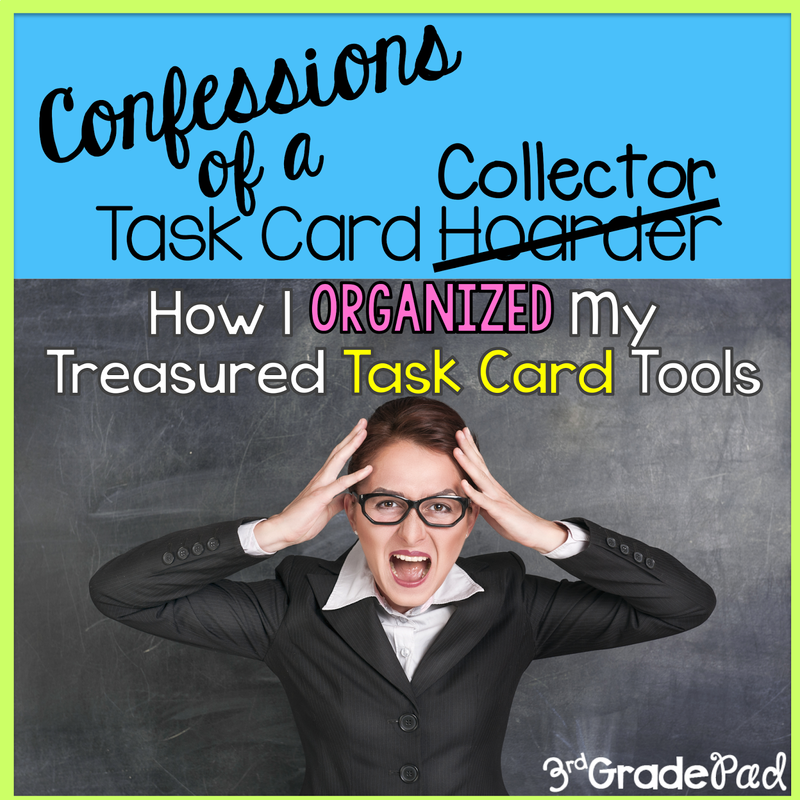 What’s a teacher to do with SO much stuff and want to start the new room FRESH and ORGANIZED? If you are like me…..you just take the mess home. First on the agenda is to deal with my task cards. I have a love/hate relationship with them. I love GETTING them. I love CREATING them. I love USING them. What I have yet to love is how I MANAGE them. And by MANAGE...I mean STORAGE. I have quite a few things I really like and have worked for me.I picked up loads of accordion folders at the Target Dollar Spot-often times on SALE! They work GREAT to tape the cover on the outside while keeping the contents inside. The rigid index card holders are perfect, too. Photo albums from the Dollar Tree will hold not one but TWO sets of task cards. Awesome! 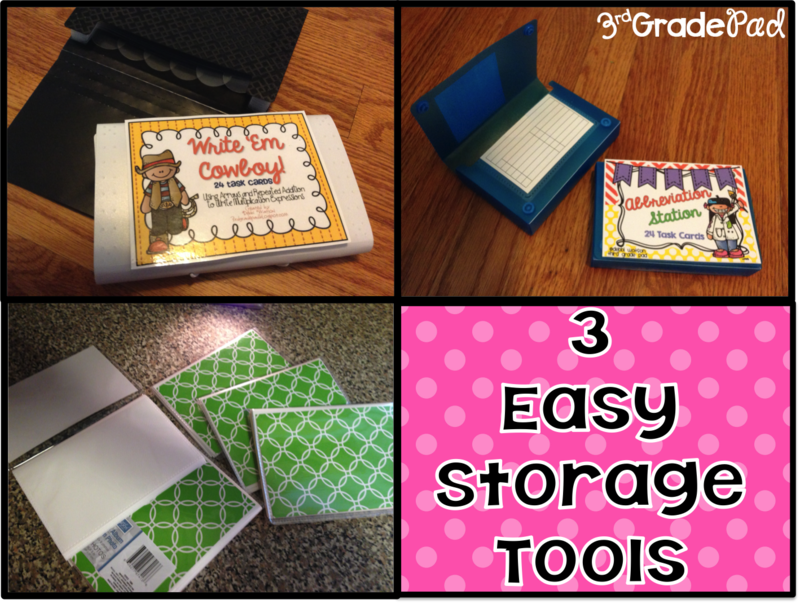 Perfect for Word Work-no worries of them getting out of order or lost cards. While I still intend to use these when they are assigned, they didn’t work well in my storage bins. It ended up being a hodge podge, didn’t fit well, and it was hard to find what I needed. I’d have to ask myself what did I store it in last? Well…for someone who forgets why they went upstairs…that just wasn’t going to work for me long term. So, I brought in the pile of task cards and bins into the living room and set to work! Yes…those ugly clips that seem to sit in my closet unused. But….I have a plan for them and they will be the answer to my organizational needs. Without doing anything extra, I like that I can easily just flip through them so easily!! I purchased a package of circle labels in three colors to help me code them. I am labeling the top of the clip with the appropriate grade level so that I’ll know right off the grade level I need: whether it's for remediation, on-level, or enrichment. If there is a CCSS that I can label it, I am writing the standard on the sticker! As you can see, I’ve given myself a little reminder in the back to make sure I don’t FORGET my new system! Since the INSIDE got a facelift, I created new labels for the OUTSIDE! This was a great project that will keep by busy for a few days. Once I started labeling, I found that I had to pull off some of the stickers to make room for two. I'll be back soon with PART TWO! 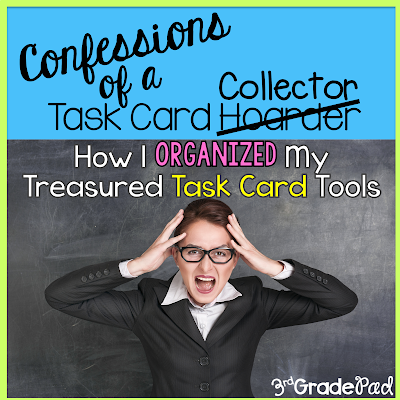 Here's a little hint.... you can't have task cards without answer sheets and answer keys! LOVE this idea!!! I have been battling this same problem! I thought I came up with a way I could store them but it's not working out the way I would like them too! Can't wait for tomorrow's post! Looks great! Are the labels available?